March 8, 2017 - A baby marsupial got a second chance when passersby spotted its mom lying dead on the side of the road and stopped to check her pouch. They pulled out a live joey and brought it to the vet. The rescue occurred near Brisbane, Australia. 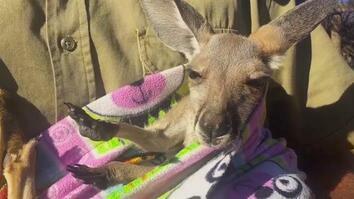 Read more about this baby kangaroo rescue and what it will take for the young roo to survive. A couple saw a mother kangaroo lying dead on the side of the road. 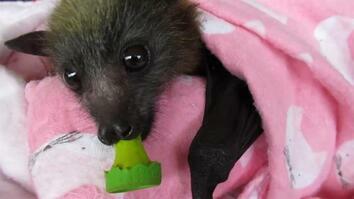 They pulled a tiny joey from her pouch and brought it to a vet. Baby marsupials can survive in their mom's pouch for several days after she’s been killed. Without mom, this hairless joey will need 24-hour care to survive. That includes a makeshift pouch and special formula. 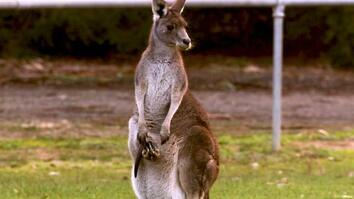 An estimated 20,000 kangaroos in Australia are hit by vehicles every year.